Earilier this month a friend and I took the Taste of Puebla tour. We had a fantastic guide, Maria who went above and beyond to make our tour memorable. She spent the entire afternoon with us, taking us to several different tasting spots, trying a variety of different local specialties from savory to sweet. We were told we could have more if we wanted, but there was plenty of food, and we couldn’t have asked for more. Maria was so informative, friendly, and very patient with our questions and picture taking. Her English was excellent. In addition to learning about the cuisine of the region, we learned much about the city and culture of Puebla. It was more than just a food tour. We visited areas of the city that we probably would not have found on our own. I can highly recommend this tour, it is not to be missed. Plan to come hungry!!! I took both the Mexico City Street Food tour with Arturo and the Puebla tour with Aleyn; both were outstanding. You get a discount (5%) on the second tour booked. Arturo made the Mexico City Street Food tour a lot of fun; four hours flew by as we joked around together and sampled food from about 11 different vendors. Do not eat breakfast before this tour. I had to pace myself and not finish each serving so I wouldn’t be too full by the end. The other people on the tour were an eclectic and international bunch and very friendly and interesting to talk to. Arturo gave us a handout with the locations we visited as well as useful phrases for ordering street food. Taking the tour really helped me recognize common street foods like tamales and tacos de canasta and increased my confidence ordering from vendors during the remainder of my time in Mexico. The Puebla tour with Aleyn was also fantastic. She is very personable and knowledgeable and speaks impeccable English. The foods Aleyn selected were all incredibly delicious: gourmet street food. Aleyn thoughtfully requested the leftovers to go at each stop, so that by the end of the tour I had a bag of leftovers to have for dinner that night. The tour also included historical information, a visit to a market, and stops in talavera pottery and glassware shops. Aleyn wrote down all the places we visited and what we ordered in detail, and also gave me further restaurant recommendations for Puebla and Cholula, such as the best place to try a mole sampler platter in Puebla (Mesón Sacristía de la Compañía). All her recommendations were excellent. Next time I come back to Mexico I’m definitely doing another tour. They do cost more than the competition but the quality of the experience is worth it. The tour of La Merced market was one of the highlights of my trip to Mexico. I generally prefer not to do tours as I like exploring things on my own, however, my trip to La Merced would not have been the same without Paco. He knows so much about the neighborhood, the market, and the countless items that can be found there. He also clearly has a great relationship with lots of the vendors. Thanks to Paco I had the opportunity to try different foods that I never would have dreamed of eating. If you love food and/or exploring different cultures the Eat Mexico tours are an absolute must! We did 2 tours with Eat Mexico. Day tour street food and night tacos + mezcal! Both absolutely AWESOME! We had the best guide ever! Food was/is just superb. Street food tour is just a must do in Mexico City, best way to see and experience the local culture. We took the street food tour with Victor and experienced Mexico City in a way that we never would have been able to on our own. He is a fantastic guide–knowledgeable, warm, a great sense of humor, and obviously passionate about the rich history and cultural influences that make authentic Mexican food so unique and interesting. We paid for the hotel pick-up, and our car was right on time–the tour started from the moment Victor arrived. We waited for another couple and then began walking around the varied neighborhoods of downtown. We stopped at many wonderful street vendors and each one was an education and experience in itself. One word of warning: pace yourself! The food is all so delicious it’s tempting to fill up at the first couple of vendors. You’ll definitely want to leave room to taste everything. Victor made the tour incredibly memorable. He’s generous with his knowledge and fascinating to listen to. He’s also a lovely person. At the end of the day, you will gain a deeper understanding of Mexican food and people, enjoy great conversation, and you will have made a friend–if you ask me, that’s what great travel memories are all about! Having read about a tour of the mercado La Merced, I was intrigued and signed up for it. Well my expectations were more than met! For four hours I learn a lot about Mexican gastronomy and tried a wide range of very delicious and flavoursome food. Our guide Arturo shared with us a lot of information and answered all of our questions eagerly. The whole tour (meeting up, going to the market, navigating the stalls…) was very smooth and well-organised. I am very happy I signed up for it as it was definitely a highlight of my trip! Thank you Eat Mexico! Arturo was a phenomenal guide on our tour through La Merced. He excellently explained each food and had great relationships with each food stall that we stopped at along the way. We tried a tremendous variety and amount of food throughout. The tour was great value based on the quality and quantity of the food and information. Cheers Arturo! We did the late night tacos & Mezcal tour with Arturo. Arturo was an exceptional guide, very knowledgeable and friendly. I hear people say all the time why pay for a food tour, without this tour we would never have tried or known the best places to go for food, plus with the language barrier who knows what we would have ordered on our own. I highly recommend this tour, especially when you are limited for time, do your normal site seeing during the day and food tour at night. 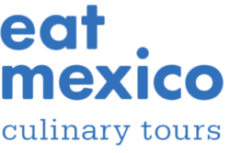 I signed up for two tours with Eat Mexico on my visit to Mexico City – I did the Street Food with Arturo and the Merced Market tour with Paco. Both tours were fantastic, the food was amazing, and they were one of the highlights of my trip. They took took me to places that I wouldn’t have gone to on my own, and I learned so much!